This year (2011) marks the Twentieth Anniversary of an ensemble that has included more than sixty-five members, all devoted to mastering a style of music rooted in the traditions of the gong orchestras of Southeast Asia, specifically those of Central Java in Indonesia. 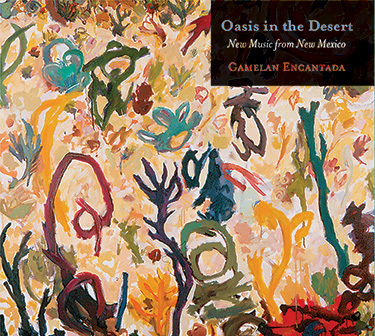 Yet Gamelan Encantada has also been committed to performing contemporary and experimental works for percussion orchestra, with a focus on commissioning pieces by New Mexican composers, such as those presented here. These pieces all represent a link in a now world-wide movement to connect deeply and respectfully with the music of another culture, then somehow transform that experience in order to create works that might contribute in some way to one’s own musical heritage. In this way, I believe we are encouraged to expand our ideas about “family” to include people living (and listening) in very faraway places, while at the same time strengthening the ties that bind us to our own local cultures and communities. Before coming to New Mexico in 1988, I had studied and performed with both Southeast Asian and American gamelan orchestras in my adopted homes of New York City and the San Francisco Bay Area, as well as in Java and Bali. My move to New Mexico presented me with a dilemma: for the first time in my adult life, there was no gamelan group to join. So I had steel and aluminum keyed instruments built, imported a set of gongs and drums to match the tuning, found a few friends willing to play, and started out on this adventure. I want to thank all of the performers, composers, and listeners who have contributed to the success of Gamelan Encantada over the past twenty years. This beautiful music has always been, and will no doubt continue to be, a central theme in my life, and this particular ensemble has provided me (and hopefully many others) with a refreshing, constant, and enduring refuge—truly, an Oasis in the Desert.